2013 will be, without any doubt, the year of Quentin Tarantino's new masterpiece, Django Unchained. One of his previous works of art to be seen on the big screen was Kill Bill. What does this all have to do with the new The Meteors, you could ask yourself now? Well, when listening to their new record, Doing The Lord's Work, you think you're listening to the Kill Bill soundtrack the entire time, definitely during the intro song, My Psychobilly Syndrome. 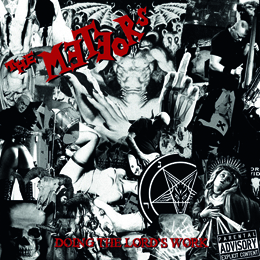 The Meteors have already been around since 1980 and Doing The Lord's Work is the latest studio album by these undisputed 'Kings of Psychobilly' (as they call themselves). The record is a perfect mixture of psychobilly, rock'n'roll and country. The Meteors prove on Doing The Lord's Work that they won't be giving up on the psychobilly crown any time soon.